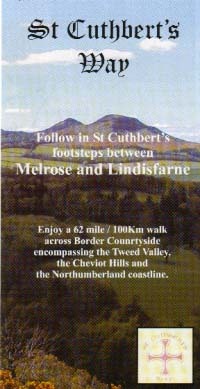 St Cuthbert's Way - Walk News. We are delighted to inform walkers that the temporary diversion that was in place for a large part of the summer has now been removed and the original path along the river bank has been reinstated. This temporary diversion was required due to the exceptionally wet period in at the start of the year when the River Tweed saw some very high river levels and the steep river bankings got extremely wet. 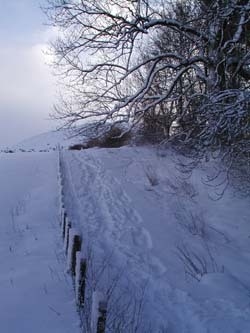 This resulted in undercutting of some riverside paths and a significant land slippage just to the north of Benrig at a point called "The Pot". 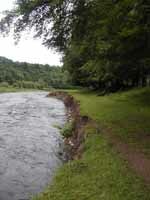 The first image is from the Way just to the south side of Mertoun Bridge and the River Tweed has undercut the banking. Fortunately there is still plenty of space remaining for the walk to pass safely between the river and the trees.However this section has been bye passed by the temporary diversion. 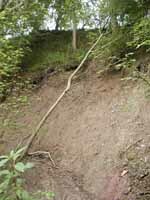 Not much further past this point the landslide is reached and the remaining three images are of this slippage. 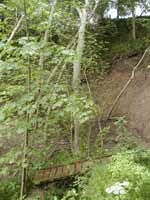 This cannot be safely crossed in its present condition, hence the requirement for the diversion. This location is know as "The Pot" and is located at NT60588 31215. The original route between St Boswells, at the golf course end, and Maxton Kirk is approximately 2.75 miles and takes at a brisk pace 55 minutes. The diversionary route is 1.75 miles and can be walked in around 25 minutes, the last 0.6 miles being back on the original Way from Benrig cemetery to Maxton Kirk. The diversion signage has been very well set up, but it is unclear as to when or indeed if this riverside section is going to be restored. It would be a very significant loss to the route as effectively 2 miles of enjoyable and attractive riverside walking would be lost and replace by pavement and road walking. We would encourage all walkers on this section of the Way to write or e-mail the Scottish Borders Council Access and Ranger Group and lobby for the very earliest reinstatement of the path at "The Pot". On the first Monday of the summer months there is the opportunity for those interested in St Cuthbert and his early life at the 7th Century monastery in Old Melrose to enjoy a guided walk around the site. The image is of the elevated Chapelknowe where it is understood that the Monastic chapel was located. This section of the Old Melrose estate is not open for general access however there are many parts and paths open to the public to enjoy at any time. 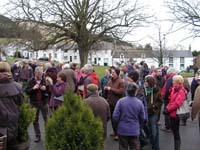 The Old Melrose Tearooms and Craft area is the ideal starting point for such walks. For more information on this location and what can be seen link to the "Old Melrose - Early Christian Community" page. The Community of Aidan and Hilda are an Ecumenical Christian Group with a very stong presence on the Holy Island. They also run one of the Retreat houses on the island and offer pilgrim walkers access to devotional material and daily devotions. 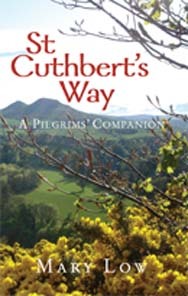 They have produced a "Pilgrim Prayers and Songs" downloadable booklet that has been prepared especially for St Cuthbert's Way. This can be accessed by clicking on this LINK. As this downloadable resource has a recommended retail price (RRP) of £1 but can be downloaded at no charge from this website, we would ask you to link to the Aidan & Hilda Community website and make an appropriate on line donation to their charitable work. Although we are not wanting to present a point of view on the applications that are being submitted for wind turbines on countryside that is close or adjacent to this walking route we feel it appropriate to bring such plans to the attention of walkers or potential walkers on the St Cuthbert's Way. 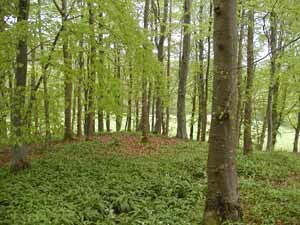 Presently there are a number of applications and indeed developments on the Northumberland side and two in particular are close to St Cuthbert's Cave on the Kyloe hills. They are Middleton Burn (16 turbines) and to the south closer to Belford the Belford Burn plan (9 turbines). The development that is further away and under construction is at Barmoor (6 turbines). 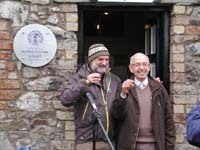 On the 9th February 13 at the Border Hotel, Kirk Yetholm, the starting plaque of teh Gore-Tex Scottish National Trail was unveiled by cameron McNeish in front of an group of Yetholm residents and a gathering of walking enthusiasts. 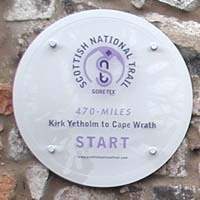 The Scottish National Trail was developed by Cameron McNeish and runs from Kirk Yetholm to Cape Wrath, a distsance of 470 miles / 756 km. The route makes use of sections of several Scotland's Great Trails as it heads via Edinburgh, Glasgow, Callander, Aberfeldy, Kingussie, Fort Augusutus, Achnashellah and Kylesku to Cape Wrath. 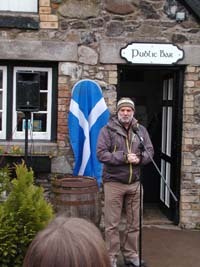 The now recognised starting point is marked by the plaque (shown right) on the wall of the Border Hotel in Kirk Yetholm only a matter of approx 1 to 2 miles from the border with England. The Border Hotel is also the recognised northern end of the Pennine Way, this being a 267 mile / 429 km trail from Edale in the Peak District into Scotland. This is also the mid point of St Cuthbert's Way. The following photos give a record of the launch event. Scotland End to End - To accompany the whole walking route Cameron McNeish and Richard Else have written and published a book titles "Scotland End to End". This can be purchased on line via www.mountain-media.co.uk. The website that was first established in 2000 has proved to be a major success and quickly climbed to the top of the major search engines. Over the following years the site has seen constantly updating and it continued to be the number one site on the Google search engine. We have recognised the need to refresh the site look and what you are now looking at is the new look site which was loaded in the Autumn 2011. With the change in appearance we have retained all the valuable information that was contained in the previous version and added some new content and pictures. This site will continue to be regularly updated with new data and with route news that could be important to the walker. With the change of look we have also changed the web server. 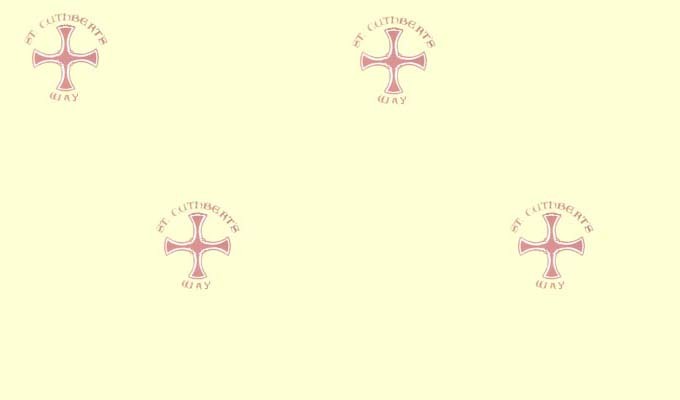 The url remains the same "www.stcuthbertsway.net", the secondary url which was associate with a "fsnet.co.uk" file extension will shortly cease to operate. We are always pleased to receive comments from visitors to the site and we have supplied an easy to access web questionnaire and we would appreciate any responses that are given via the questionnaire or by e-mail. This book is written by Mary Low and published by "Wild Goose Publications". This is a book that is especially written for the walkers on this route who are undertaking it as some form of spiritual or pilgrimage experience. The book has material in the form of meditations, songs and background on St Cuthbert. The companion also has information in the form of a guide to places to visit and individuals that can offer the walker help along the Way. For more information on the book and to order on line visit www.ionabooks.com. Northern Cross have been organising Pilgrimage Walks over a number of year and again in 2011 they held the Holy Week walks to Lindisfarne at Easter. There were several legs to the route. Steeped in English Christian history, & the footsteps of Northumbrian Saints, this crosses the dramatic Simonside Hills to reach the coast. From Melrose to Holy Island through the Scottish borders stunning landscape. Fellowship with Christians of many traditions in the picturesque borders on a challenging and enjoyable route over the Cheviots. A different pace, located in one place, for families with children, all ages from babies & toddlers upwards, including older siblings through to young teenagers. All activities are children orientated. A longer walk, taking 2 weeks to cross from Iona to Lindisfarne, in the footsteps of St Aidan. This was with bivi-bags / un plannedcamping. 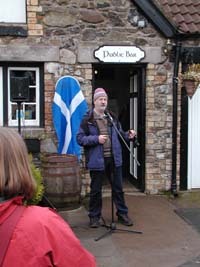 The Pilgrimage event will again be run in 2012. The dates for the various legs are from the 31st March to a completion on the 8th April. There are two exciting projects underway that relate to offering walkers a welcome and space in which to stop, relax and reflect. The first and presently more advanced is the Kirk Yetholm Church Project. This is related to not only the recently completed refurbishment of the church building but to further developments to have this as a centre for "visitors, pilgrims, walkers, family and history researchers". This building is open to all during the day, to visit, relax and find a space where there is interesting information related to St Cuthbert and the Way. It can furthermore be used by groups of walkers and pilgrim on the Way and the local minister will be pleased to welcome such people. For more information on this you can e-mail Robin McHaffie or link to the Churches' website. The second project is in nearby Morebattle where the old church of St Aidan's is being restored to a place of welcome, refreshment and worship. Since 1952 the building has been used for a variety of purposes but mainly as a transport garage for local bus and haulage companies. It is now in the ownership of the Pedersens who are planning to have this open in June 2012 as a coffee shop, a place for worship and reflection and ultimately a conference and accommodation centre. For more information on this development you can e-mail Richard Pedersen or link to the Coffestop website. 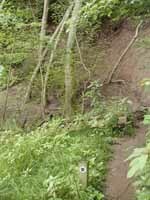 This route is waymarked and should present no navigational problems. We do however advise all walkers to take supporting maps be they specifically produced for the walking route or are area Ordnance Survey Maps. An additional aid to navigations are the Grid Reference Instructions produced by Walking Support, these instructions based on O/S Grid References. Many walkers have found this a useful additional piece of information and it can be obtained for an nomimal charge of £3.99 and sent as an e-mail word attachment. Simply purchase on-line by pressing the "BUY NOW" button and folllow the secure payment instruction. Starting in the Autumn 2007 and still running, the St Cuthbert's Way Route Management Group are co-operating with research work being done by Dave Herbert & Leslie Francis of the University of Wales. We believe that within this research questionnaire there will be data that is important to the future maintenance and development of the Way. We would encourage all walkers past and present to access this questionnaire by clicking here and respond on line. If you are also willing after responding to the above to undertake a shorter feedback the Webmasters and members of the Route Management Group continue to be keen to get your feedback on the website and the walk. The following on-line questionnaires has been active for many years and we would continue to encourage you to spend a few minutes responding via the electronic website questionnaire and the route questionnaire. I-Net Support in conjunction with Walking Support are producing a Walkers' Newsletter in e-mail format. This is free and available to all that register to receive information related to this and other long distance walks. To register just click here. We will not supply your contact details to any other business. 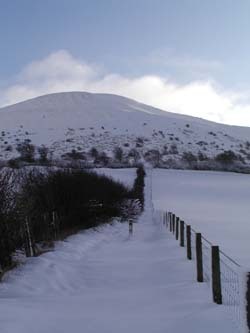 The St Cuthbert's Way has beeen designated one of Scotland's Great Trails. This is awarded by Scottish Natural Heritage and to gain this accolade certain criteria need to be fulfilled in terms of walking quality and maintenance. 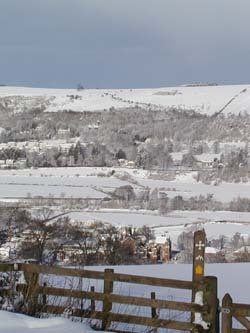 St Cuthbert's Way was in the first group of routes to be awarded this designation in 2010 but is unique in so far as part of the route is also within England. Sam Clark, a 10 year old boy from Bath has now successfully completed his walk along the full length of the St Cuthbert's Way. 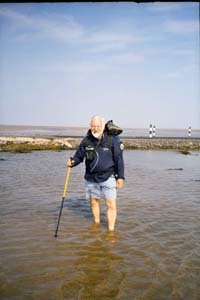 He started on the 27th July and completed the walk to Lindiesfarne on the 30th July 2008. Sam knows that he has already achieved his target of £3000 for Habitat for Humanity, this being a non-denominational Christian Charity, and this sum will be enough to build two houses for the homeless if not even a third. Also walking was Sam's Dad who last enjoyed this route in 2002. 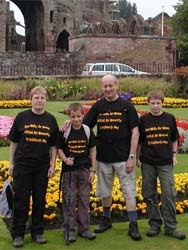 In support were the rest of the family, Mum and elder brother, and as you can see from the picture all were sporting special tee shirt promotion the sponsored walk. This has been a large sum of money raised through a single walker and by the end of the walk Sam knew that with known additional commitments the sum raised is now exceeding the £3000. It also seems likely that with this target being broken there will be enough for a third house to be built. So even although the walk is over any further pledges would be welcomed by Sam and anyone can still donate on his own fundraising page by clicking on www.justgiving.com/samwalksforhomes. Any such payment made on-line is via a secure link. Ian (a retired C of E clergyman 67 years young) and his daughter walked St Cuthbert's Way between 31 August and 6 September; Ian being sponsored for St Andrew's Children's Hospice in Grimsby. We now have a feedback and are delighted to update the website with this detail. "Just to let you know that on our walk in September, which you kindly feature on the website, the sum of £528 was raised for the hospice. "Thank you, John, for accompanying us for the first half hour or so, it was a good send-off!" 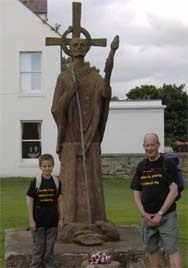 It is known that many groups are using the St Cuthbert's Way to raise money for charity. If you have any news that you think should be provided, please contact us with details. With the financial sponsorship of the Scottish Borders Tourist Board, I-Net Support (webmaster) were able to design and produce an informative leaflet on the St Cuthbert's Way. This leaflet has been distributed widely throughout the area and to walking groups and individuals. It is hoped that through this and other initiatives the knowledge and attraction of the walk will be extended and more individuals will come to expereince the Way. Anyone wanting to receive a supply of leaflets, be it a hotel, B&B or walking group, should e-mail the webmaster and state the address for delivery and the number sought. Scotlands Pilgrim Routes Forum (SPRF) was established in 2012 and is a forum of organisations and individuals who recognise the importance and growth of Pilgrim walking both here and throughout the world. Within the UK the St Cuthbert's Way is one of the main Pilgrim routes that are walked, and this by a very international set of walkers. SPRF believes that Scotland has many other Pilgrim walking routes that could be enjoyed, some already in existance, some in development and yet further that are but an idea. The knowledge of what happens on St Cuthbert's Way is being used to help develop other routes in the belief that "Faith Tourism" is large and growing and can equally bring benefits to all walkers, be they spiritually minded or not. 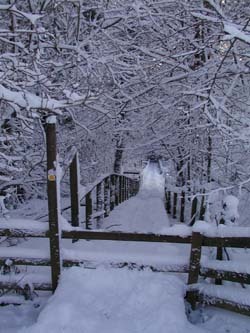 The winter snows of January 2010 were unusual in their intensity and duration while also being beautiful. Here are a few images from the first mile of the route. Even in the winter this is a route worth exploring.